During CWL NOLA, the Call of Duty World League detailed how their Pro League Stage 1 event will work. 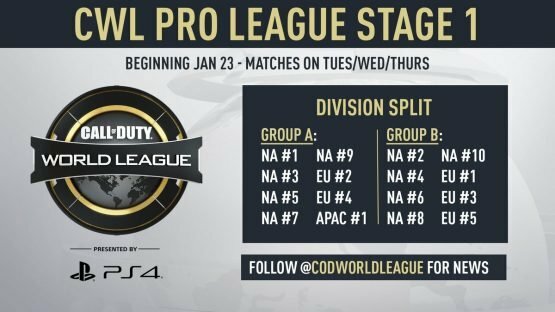 It will bring together the 16 top teams (ranked by pro points) in the world together, and it’ll take place from January 23 (matches will take place from Tuesday through Thursday each week) until April 8. As you can see the first Division (Group A) will be comprised of the #1, #3, #5, #7, and #9 ranked teams from North America. Additionally, the second and fourth ranked teams from Europe, and the best Asian-Pacific team will be in that group. Group B will also be comprised of eight teams, although they’re all from North America and Europe. North American representatives will be the #2, #4, #6, #8, and #10 ranked teams. The three European representatives will be the #1, #3, and #5 ranked teams. The first stage will take place from January 23 through April 8 with all 16 teams facing each team in their group twice. All of this will culminate in a playoff event in Columbus, Ohio. There fans will be able to attend the three day event where the winner will be culminated at the MLG Arena.